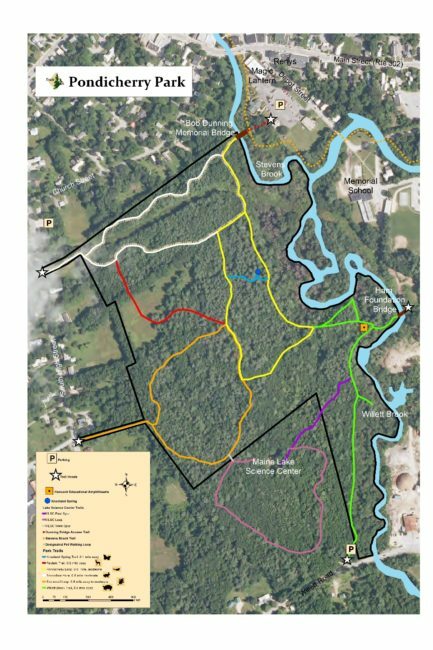 Pondicherry Park is 66 acres of woodlands, wetlands and fields in the heart of downtown Bridgton. It features two miles of walking trails, and one mile of frontage on Stevens and Willett Brooks. 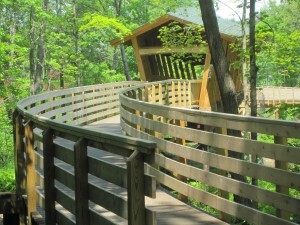 The park has numerous boardwalks, an educational amphitheater, historic Kneeland Spring and two beautiful bridges spanning the brooks. Pondicherry Park was created through a partnership with Loon Echo Land Trust, LEA, and abutting landowners. The land acquisition and trail creation was funded through generous foundations and private individuals. Pondicherry Park was donated to the town of Bridgton in 2012 with a conservation easement held by Loon Echo Land Trust. Pondicherry is home to many species of wildlife and has numerous terrestrial and aquatic ecosystems that are conducive to hands-on environmental learning. For more information about LEA’s year-round nature walks and educational programs in the park check out our events calendar. Thank you for respecting the use guidelines.